Sant’Antonino, Switzerland, February 8, 2019. With its new DC drive platform, the Interroll Group—the leading global material flow solutions provider—will present modular plug-and-play solutions for the smart conveyance technology era at this year’s LogiMAT trade fair, February 19–21, 2019 in Stuttgart, Germany. 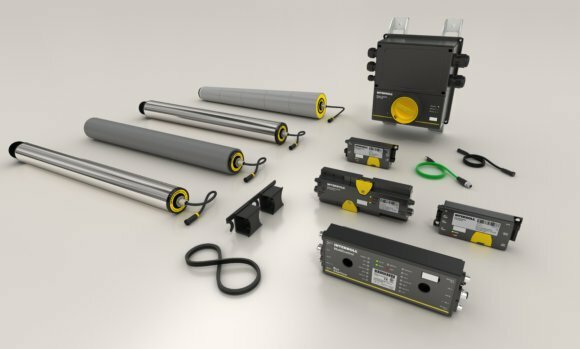 Interroll’s new DC platform consists of a range of coordinated motor rollers—the RollerDrive—as well as control systems and power supply elements. System integrators and plant constructors can use this platform to provide tailor-made solutions to meet their customers’ needs for powerful conveying solutions. The heart of the DC platform consists of the new EC5000 RollerDrives, which individually drive the conveying zones of zero-pressure-accumulation conveyors in combination with the corresponding control systems, such as the Modular Conveyor Platform (MCP) from Interroll. When compared to the well-known RollerDrive EC310, which remains available, the new RollerDrive product family is impressive thanks to a number of new technical features. For instance, the RollerDrive EC5000 is available in a 24-voltversion as well as a future-oriented 48-volt version. What’s more, customers can now choose between three power levels—20-watt (W), 35W and 50W— for the motor rollers. The new motor rollers are also suitable for transporting heavy goods, thanks to their 60 mm diameter, and are equipped with both an analog interface and bus interface. Conveying solutions now offer data transparency thanks to the bus interface and corresponding control system. This means that users can consistently visualize a range of information and functions using the programmable logic controller (PLC) or a web interface. Examples include the display of information about the current operating state and the operating load of the individual drives and additional detailed information regarding the torque or temperature. This information can be read out and processed. Users can precisely control more than the acceleration, speed and deceleration of the conveyed goods in the system: This solution also allows them to position the relevant goods on the conveyor to the nearest millimetre, a key requirement in order to guarantee seamless conveying interplay with robots or automated gripper arms in an Industry 4.0 environment.